The story's in the past with nothing to recall. don't need you at all. that's all I'm gonna spend. And I think it's gonna be all right. Now the morning sun is shining like a Red Rubber Ball. Unfortunately, that's only me and there are plenty of other people who won't give up. 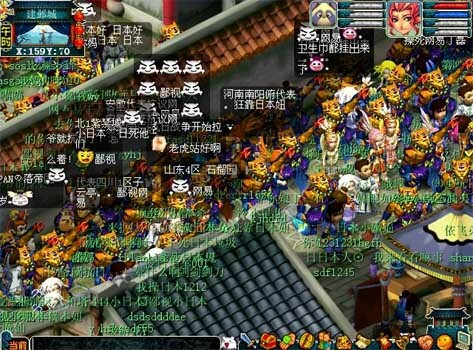 Early this morning over at the Netease game "The Fantasy of the Journey West," there was a mob scene of cursing players at the area known as "Jianye city government office." 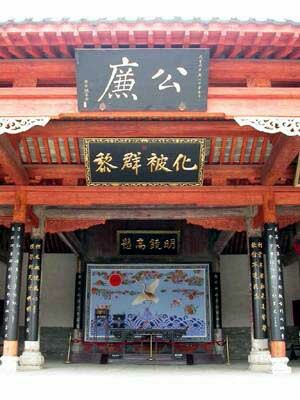 The reason was that this Tang dynasty "government office" had a background that looked like a "Rising Sun." 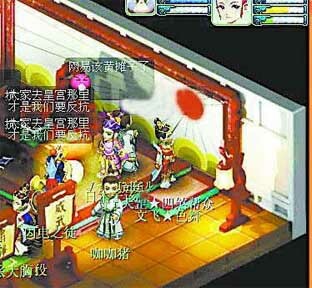 At around 1am, the reporter found a screen capture of the game in which there was a white screen at the back of the government office. In the middle, there was a red sun from which light rays emanated, such that it allegedly resembled a Japanese flag. According to Mr. Guo, a Beijing game player, someone noticed this "Rising Sun flag" about three days ago. The news spread quickly on the Internet the next day. 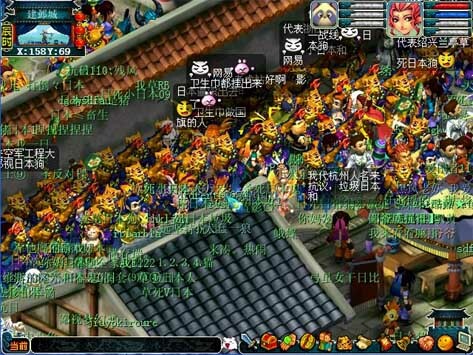 Almost 10,000 game players from around the nation gathtered there to express their dissatisfaction or anger. Yesterday morning, the curses reached a climax. 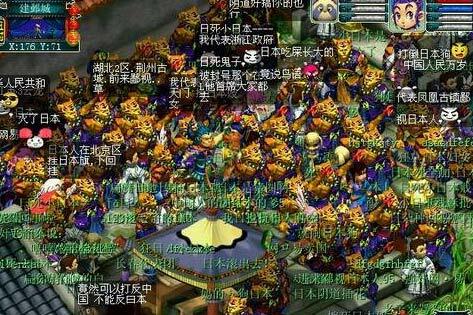 The reporter visited the game area known as Summer Palace and saw the place filled with the IDs of all the dissatisfied game players. "To raise a 'Rising Sun flag' in a Great Tang government office is obviously a challenge and an insult!" said local game player Mr. Zeng angrily. Another game player Ms. Lu could not conceal her disappointment: "Even although everything in the game is virtual, our feelings are still genuine. This incident has seriously hurt our feelings. We find this unacceptable." 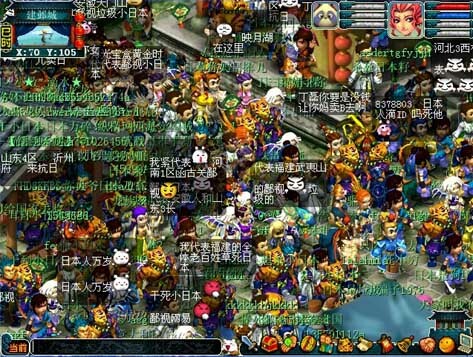 According to game player Mr. Gu, many game players contacted the customer service line after the incident broke upon, but the other side only repeated: "No comment." 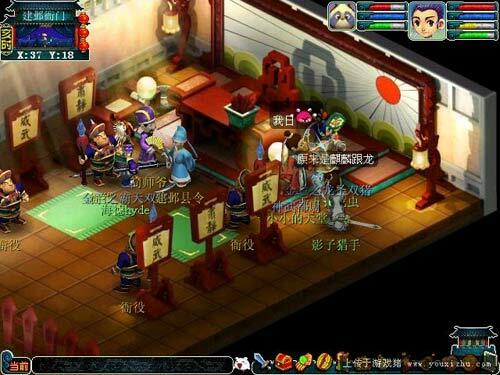 Mr. Guo said that the word among the game players is that the "Rising Sun flag" is present in a Tang dynasty government office because some of the stock shares in this online game have been purchased by a foreign company. This explanation has not been confirmed. On this, Peking University Department of Sociology professor Xia Xueluan said that a natonal flag is not an ordinary commercial product because it is the symbol of a sovereign nation. Therefore, to hand the flag of one sovereign nation at the symbolic place for another sovereign nation is a form of public challenge. 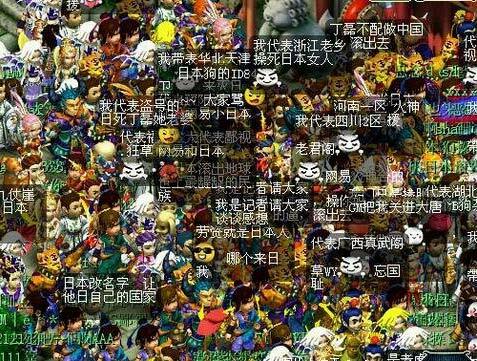 Professor Xia said that the game's planning and operation department should consider the social meaning of the game instead of the mere commercial value. While entertaining the public, they ought to educate and lead people to make the proper value judgments. The reporter attempted to call the Guangzhou customer service line for the game many times, but has not gotten through up to the dealine. But the reporter saw a public notice posted at the game's community service area about this incident. 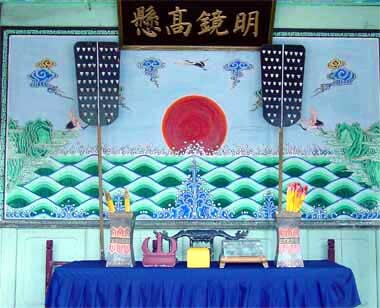 The picture at the back of the government office was said to have been based upon the "Sunrise in the East" painting, which indicates that "when the sun rises from the east, all is clear and bright." 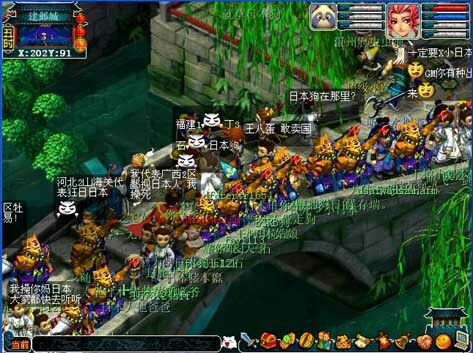 The administrator said that while the game players' patriotism is understandable, all patriotic activities should be rational and not be led by some ridiculous rumors. The reporter spoke to many specialists at the Department of Culture in the city but none of them have expertise in this painting. An expert art historian on Ming and Qing dynasties said that the original piece is not collected in Beijing presently, so there is no way to verify. Here is a follow-up based upon some of my research. 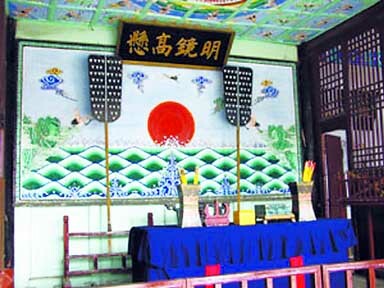 It is known that government offices had the "Green Mountain Ocean Water Morning Sunrise painting (青山海水朝日图)" background (see history.163.com). The purpose is to remind the presiding official to 时刻清醒，不欺百姓，莫负国家 (always maintain a clear mind, never mistreat the people, never betray the nation). The Japanese flag is a white banner with a red circle representing the sun in the middle. The Japanese flag is called Hinomaru, which means "circle of the sun." In English it is sometimes called the "rising sun." This flag is often derided in Chinese Internet forums in an obscene manner. 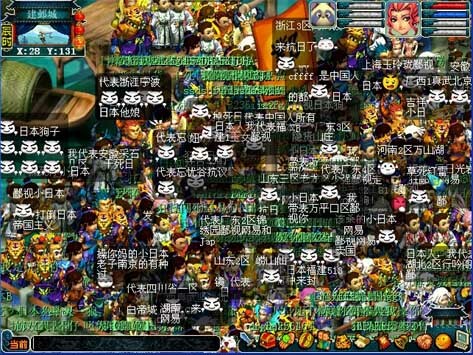 For example, in the following screen capture, the person underneath the 'bear' on the top-right of the screen is saying: "Netease, you have even hung out the sanitary napkin." Thus, the image is that of a single spot of blood on a white sanitary napkin. But all this is missing the point here, because we have to look at the actual background in the Netease game itself. The photograph below shows a red sun on the top-right side with twenty-two grey-black rays emanating outwards to represent rays of sunlight. Now this is taken to be the Japanese Imperial Navy flag adopted in 1889. As shown below, this flag has a red sun on the left with sixteen red rays emanating outwards. So the position of the sun, the number of the rays and the color of the rays are different. These days, the American politicians are even talking about a constitutional amendment to criminalize flag desecration. The Chinese, Japanese, British, Germans and others feel the same way about their own national flags and anthems. If Netease had modified the Japanese naval flag by flipping the position from left to right, increasing the number of rays from 16 to 22 and changing the color of the rays from red to gray, do you think the Japanese people will actually applaud the act? They would lynch Netease for doing that! This is like flipping the positions of the five stars on the Chinese national flag from left to right, decreasing the number of stars by one and changing the color of the stars from gold to black. If such a flag were to appear in a Japanese online game, would the Chinese be pleased? They would be saying that their feelings have been hurt!! !